DOCTOR WHO: The Master Encounters - SURVIVAL | Warped Factor - Words in the Key of Geek. Christopher Morley looks back at the final classic Who story, Survival. 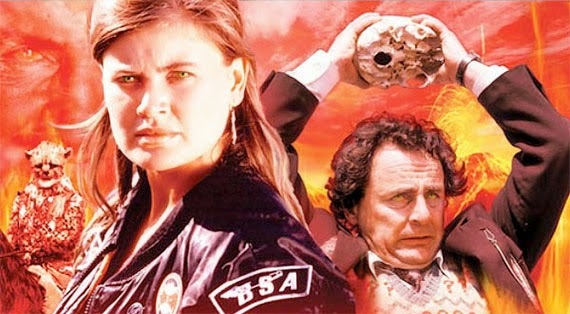 With hindsight, Survival seems a rather ironic title for what history now records as the last stand of 'classic Who', given that in effect Michael Grade made the programme suffer a slow, agonising death. Of course the writing could have been on the wall far earlier- the Sixth Doctor's Trial Of A Time Lord arc serving as a neat sci-fi analogy for what was going on in the BBC's universe. The death sentence could have been passed then, but the axe was delayed. The BBC still harboured a desire to wipe the Doctor off our screens, though, & so December 6th of the Year of our ( Time) Lord Nineteen Hundred & Eighty Nine will be remembered as the day the Doctor died- at least if you didn't buy into the New Adventures novel range, running in effect as a 61- part series from Timewyrm-Genesys right the way up to So Vile A Sin. The Doctor's young lady companion is horrified at the disappearances of most of her old friends, but Seven is more interested in the cat. Sadly he doesn't treat us to his own version of the Big Bang Theory favourite Soft Kitty, Warm Kitty in his own unique manner. Soft kitty, warrm kitty, little ball of furr....but for whom is it working, so to speak? Somebody's watching through its eyes, seeking victims to bring to their own world! Of course the Doctor is eventually chosen for this dubious honour. And the Master is the welcoming party. The Doctor was really starting to like that cat, as well. There would have been plenty of space for it aboard the TARDIS, & he could easily have allocated it a room. Alas his dream of pet ownership will have to wait. His old enemy & indeed equal isn't looking too great. If he was expecting a ' get well soon' card though, as far as Seven is concerned the Master can get stuffed. Its not a ' take two of these & call me in the morning' problem though. He's starting to look like a cheetah! Somehow the Doctor resists the temptation to laugh himself silly & offer his foe a nice cage at London Zoo once they get back to Perivale. Maybe the thought of his old foe becoming the Cheetah Master ( and in the process taking on the deadly speed & general no mucking about attitude to killing of that breed of big cat) is behind his thinking. He's most likely right to be a bit fearful, as well? The Master certainly seems a bit more of a wuss than normal, telling the Doctor that the planet on which they're standing is sentient & can possess people, as appears to have happened to the Cheetah People he's so keen to keep busy. They've become little more than animals & he's happy to have shown them the way to Earth just to buy himself that little bit more time to mount an escape.! He'll need the Doctor's help, though! Ace's hunting by/ transformation into a Cheetah Person would seem to have forced his hand, too. So begins a battle for the very fate of two planets, two species. Where the Doctor has Ace, the Master has Midge- possessed, of course. And of course there's the obligatory big fight between the Doctor & his Masterly nemesis. Cue Michael Grade laughing maniacally, the most likely candidate for a future Master in the eyes of the fans he'd so cruelly deprive of a little Saturday teatime fun. Seven did at least get an outing on the big screen in the Doctor Who TV film of 1996, though. Whether his 'fatal' shooting did anything to curb gang violence across the pond, we don't know. But die he did, albeit with a delayed regeneration into his Eighth incarnation. Rose, Pete & Jackie share it. There's a big clue, But before them came Winnie, Bev & Gabriel, residents of The Quadrant ( a run-down council estate, in another parallel with the Ninth Doctor's Tylers). Indeed, the name features in a few other examples of Davies's work outside of Doctor Who- Queer As Folk perhaps the best example. He'd also work with Christopher Eccleston pre-Who on The Second Coming. Was it a dry run for Eccleston as the Doctor? After all, his character of Steven Baxter is a Christ-like figure, & the Doctor is ' the lonely god' in a rondabout manner!